There’s a good reason wine features in so many memes. It is the coffee of the evening after all and super tasty. Because we love you guys, we did the hard work (so hard you guys) and found the best winery staycays in NSW, just for you. Okay, for us as well. Here’s where to stay if wine, views and relaxation are your jam. Located in Central NSW Blue Wren, it seems, can do just about anything. They have a winery, farm, and raise their own chooks, geese, ducks and bees. They’re our favourite kind of showing off. The Blue Wren Farmhouse is fresh from a 2016 renovation, relaxed and modern with elevated deck and pool. It’s a hop, skip and jump from the vineyard’s other features and can be set up as five bedrooms with communal chill zones or as a whole house. A visit to the nearby tasting room will earn you a sip of Shiraz, Verdelho and Merlot from the minimal intervention vineyard and you’ll tuck into a dinner that’s every bit pretty as it is delicious (and affordable) at the Chef’s Kitchen. Audrey Wilkinson is famed for all the right reasons; 360 views, a hilltop Cellar Door and passion for the good stuff aka wine. Who could ask for more? Book one of two onsite cottages, The Mulberry or The Dairy to make the most of your weekend away. Mulberry Cottage suits four couples (or a big family) thanks to a spacious living and dining area, while The Dairy is a two-bedroom convert with a wood-burning fireplace that’s ideal for smaller parties. Both are within walking distance of the Cellar Door where you can try their scrummy Oakdale Chardonnay and Tempranillo. Winning. Book a standard tasting or behind-the-scenes winery tour, for a tipple straight from the barrel before indulging in a cheese platter. Those looking to score points with their better half should schedule a romantic picnic among the vines, complete with wine master class and premium tasting before tucking in to a picnic hamper and quality drop. Looking for a weekend away where you can learn a thing or two? Coolangatta Estate has you sorted. This Hunter Valley vineyard features 1800s accommodation built by convicts and while we cannot guarantee a haunting, we can promise you’ll be cozy AF. Still not convinced? Coolangatta Estate is close to areas like Shoalhaven Heads, Berry and Kangaroo Valley, so they’re a choice pick for the wine taster who likes to branch out (yes that was a vine pun). Aside from immersing yourself in the history of Coolangatta, you can also take a very modern Segway tour of the vineyards, stopping off at the Cellar Door for a tasting and Alexander’s Grill for lunch (we recommend the locally caught oysters). We’ve officially hit the five-star estate of the bunch, so prepare to drool. Located on Brokenback Range, with rows of vines curtained by natural bushland, Spicers Vineyard Estate hosts 12 stunning rooms (no mass market vibes here) and on-site eats with the acclaimed Restaurant Botanica. After a busy day relaxing and drinking all the yummy wines of the region, (you can organise a tour through Spicers) it’s time to pop in to the on-site Spa Anise for organic body wrap or hot stone massage. In the words of philosopher Lizzie McGuire, “hey now. Hey now. This is what dreams are made of”. Fancy a bottle of natural wine? Harkham (which sounds like a crime-stricken city in a superhero flick) is the place for you. Tastings are held on weekends in the cocoon room and, if you promise us one thing, it’s that you’ll try Aziza’s Rosé mmkay? And the Aziza’s Shiraz. Okay, fine, all of them. Dash into Pop Up, their Latino street food restaurant next door for a peek at Mulga street art, fresh guac and live music. If you can scrounge together enough mates, we recommend the four-bedroom Harkham House. Aside from being a comfy spot to pull up a chair, the house has a wood-burning fireplace (winter only due to bush fire risk, soz), terrace and large hang space. We can imagine the D&Ms already. Only drink wine fertilised by extinct volcanoes? Us too. Good thing Borrodell is around to keep us happy; their range is grown over basalt soil from Mt. Canobolas. 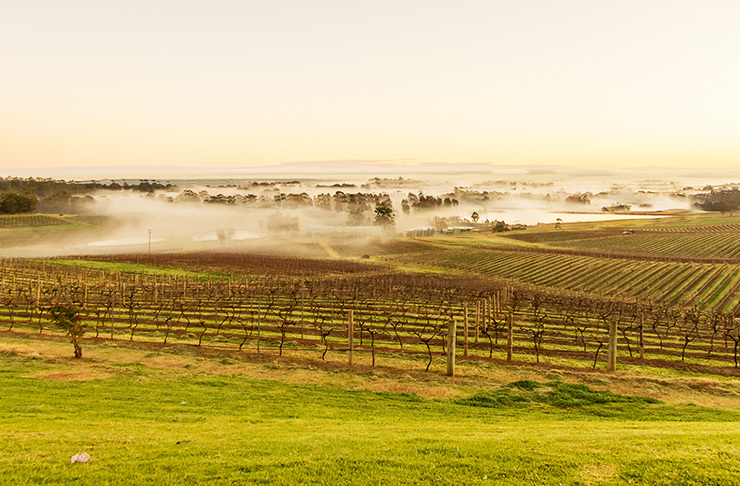 Over 1030 metres above sea level, Borrodell is one of the highest vineyards in Australia and specialise in cool-climate wines—making its wine drinkers feel like the coolest cats around. Did we mention fertilisation by volcano? Volcanoes people. Choose from a Cider Suite (ideal for couples) or Chardonnay and Truffles cottages (three bedrooms apiece) before visiting the Borrodell orchards, vineyards and wait for it… trufferie. Yes. Truffles and wine, you are in heaven. Perk up book nerds. We found the winery that gets you and your penchant for double-parking a rich red with a rich read. At Bendooley Estate you and your friends (no, not the fictional ones) can stay at their popular Book Barn Cottage where reading is not only applicable (so quiet! ), but encouraged. You can also find a good book at the Berkelouw Book Barn on-site. As for the wine, viticulturist Ben Brazenor and winemaker Jonathan Holgate have created distinct, boutique wines with varietals like Riesling, Chardonnay, Pinot Noir, Merlot and Pinot Gris. It all goes down very well with Head Chef Benn Troy’s fresh, local and seasonal meals at the Book Barn restaurant. Had enough of tastings? The Bendooley Cellar Door is worth a visit anyway as it’s been crafted using locally sourced stone, features artwork by John Olsen and a timber bar hewn from a 170-year-old radiatia pine. Peace, tranquility (and wine!) is not far at all folks. Tinonee Vineyard Estate is just two hours north of Sydney. Easy. Located in Broke Fordwich, Tinonee rings in at 50 acres of private vineyard and picture perfect scenery. 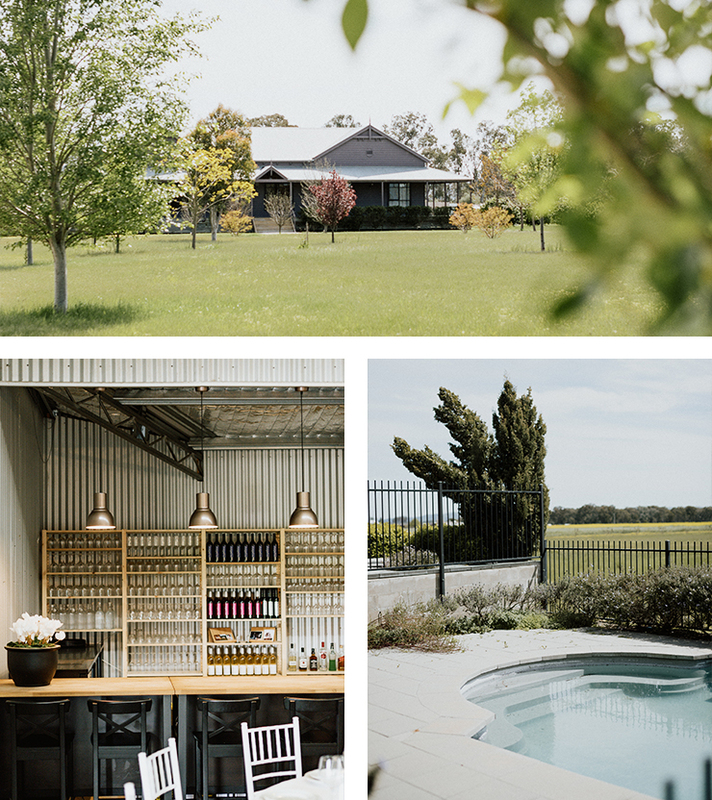 Stay at The Residence or The Dairy (both with spacious rooms and living areas) to have a relaxing, comfy AF place to retreat to after a day at tastings, restaurants and Hunter Valley activities. The Residence fits 14 with six bedrooms, three bathrooms, wrap around verandah and private pool while The Dairy suits four guests with two bedrooms, two bathrooms and view of vineyard and Yellow Rock formation. Load up the car and get chuggin’. Here are 7 Stunning Natural Places You Didn't Realise Are In NSW.